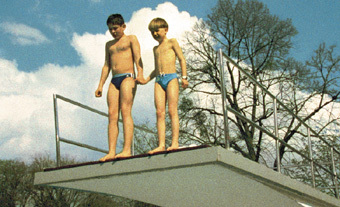 Nine-year-old Franz has climbed onto the diving-board to prove to himself that he is not a coward. For the first time in his life he's going to jump from a five-meter-board. In mid-air, though, his attitude changes. He goes back. Or rather, he tries to go back. Because his friend Patrick is blocking his way, he has to jump. Hand in hand with Patrick - eyes closed - he dares to take the leap. With the help of the most modern computer technology we experience Franz' fears and witness the fate of a human being. Oliver Held was born in 1970 in Aachen. He studied Fine Arts at the Academy of Arts in Muenster and at the University of Applied Arts in Vienna from 1991-1999, followed by post-graduate studies at the Academy of Media Arts (KHM) in Cologne from 1999-2001. Since 2000, he has been instructing Film at the University of Siegen. His films include the shorts: Haider '96 (1996), Silent Ponds (Stille Weiher, 1998), and Spring (2002).